Fun to read right from the start! The Eighth Day is a middle school Sunshine State Reader for the 2015-2016 school year. I usually pick a few books from the list to read during the year so I can help out with our middle school book club. Luckily, I can say that I have not been disappointed with what I've read this year so far! 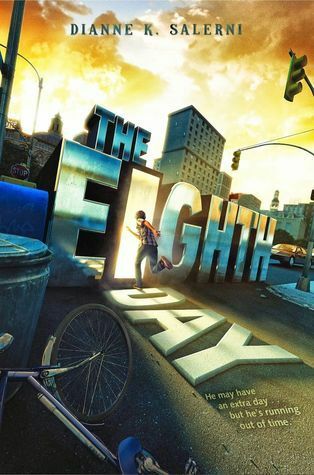 The Eighth Day is so full of action that it's hard to put down once you start reading. Jax has issues to work through, but it's nothing compared to his legal guardian's life. Talk about complicated. Add a mysterious girl living next door and you've got yourself quite a mystery. Oh, but the real mystery begins when Jax discovers there is an eighth day in the week that only a select group of people know about. Why? Because that day is part of King Arthur's legend. This book did such a great job incorporating elements of one of my favorite tales into a fresh spin on middle grades fiction. It is geared towards younger readers, so don't look for deep themes that leave you questioning life at the end of the book. You won't have a life changing experience. But you will have a great time reading The Eighth Day. I highly recommend it to all middle school kids and fans of Arthurian legend.